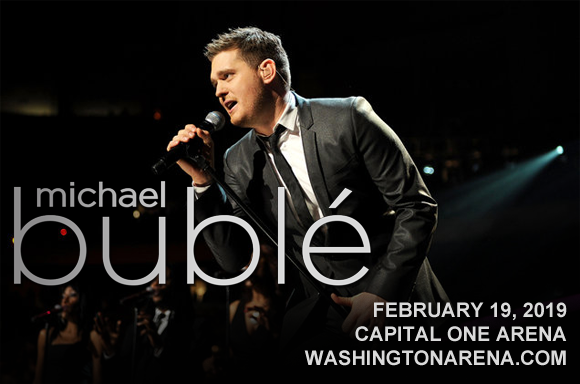 No stranger to tugging on the heart-strings, Grammy Award-winning big band pop singer Michael Buble comes to Capital One Arena on Tuesday 19th February 2019 on his Love Tour! On a mission to spread good vibes across the land, Buble has returned after a two year hiatus with incredible new material, putting any rumors of retirement completely to rest, much to the joy of fans! "This world is tough enough, cynical enough and scary enough, and I just want to bring love," Buble says. "This sounds like a cliché, but you can change the arc of someone's life just by giving them a smile, a hug, a kind word or just listening to them." Michael Buble has been entertaining fans since the 1990s. After many years of hard graft working in nightclubs, a few notable TV appearances on Canadian TV talk show host Vicki Gabereau's show and three self-released albums, the singer, songwriter, actor and record producer had his big break in 2002 when he was signed to multi-Grammy Award-winning producer David Foster's label. Buble's self-titled debut album followed in 2003, bringing him international success, followed by three number one albums in a row. To date, Bublé has sold over 75 million records worldwide and has four Grammy Awards and thirteen Juno Awards to his name, among many others. His eighth and most recent studio album, Love, was released in 2018.